TLM Laser are proud to announce a new distributor partnership with the world market leaders in Laser Plastic Welding – LPKF Laser Welding. LPKF Laser Welding Division systems and products are now available exclusively from TLM Laser in the UK and Republic of Ireland. Laser Plastic Welding is set to become the major growth area in the laser market. Its high joint quality is combined with the highest standards of safety, cleanliness and speed. The technology provides major economic advantages that can be enjoyed by a wide range of different markets. Laser plastic welding can easily handle complex three dimensional designs. The beam head itself never touchesthe material. Even poorly accessible zones or thick layerscan be safely joined. The process is material-friendly and ideal for components with sensitive surfaces. 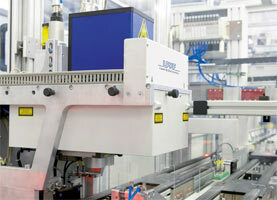 Laser Plastic Welding has already made major inroads into the automotive and medical sectors. In the automotive sector, laser plastic welding provides a more reliable and cost-effective joining alternative to screws, glue, ultrasonic or other joining methods. For example, large components such as car taillights can be a particularly tricky joining problem, especially when involving different material combinations and visible seams. With the robot-assisted LPKF Twin Weld-3D welding system, a combination of halogen lamp and laser beam can join together any type of free-form components. A defined clamping pressure is always required in thelaser plastic welding process. This is provided by thehybrid welding head, so that expensive upper dies are no longer required. The integrated air-sprung joining roller applies a constant vertical clamping pressure to the parts being joined to guarantee perfect product surfaces. Medical technology applications specify the highest levels of hygiene in production lines. In microfluidic applications, laser plastic welding is not only highly precise but as a particle-free process is the only way of guaranteeing sensitive microfluidic channels remain open and function perfectly. Laser plastic welding is also gaining ground in the consumer market, especially where precise welding seams are required on the visible parts of products and components.